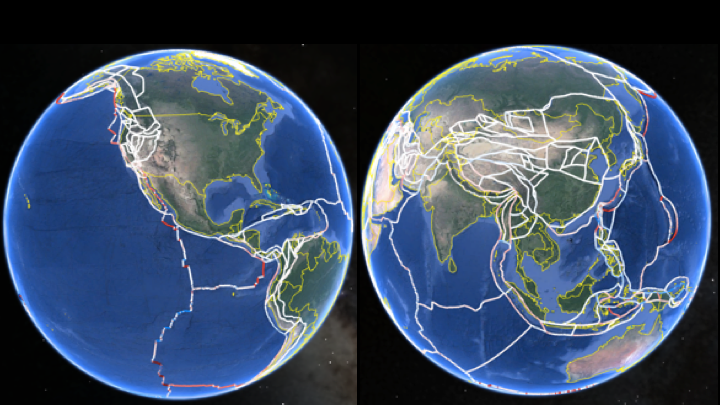 Geodetic observations of motion at the Earth’s surface reveal the complex interplay between long-term tectonic motions and short-term earthquake cycle processes. Observed interseismic deformation can be used to constrain the distribution of elastic strain accumulation, slip partitioning across complex fault patterns, plate rotations, and spatially variable patterns of fault coupling. The global block model was constructed with the goal of unifying global plate motions with fault-based mechanical earthquake cycle models in order to resolve slip deficit rates across the world’s most seismogenic faults. Construction of a global scaled block model has allowed my collaborators and I to ask and answer such questions as: What is the global moment accumulation rate and how does that compare to earthquake production? How many ‘blocks’ are required to explain GPS velocities to a resolution of 2 mm/yr? What is the frequency distribution of fault slip rates globally? Where on earth do we need more complex models to explain observations? And, how many magnitude > 8.0 earthquakes are possible globally? Interested in collaborating on Version 2 of the Global block model? Have suggestions for how to improve version 1.0? I would love to hear from you! Please use the contact page and get in touch. My research along the Mexico Subduction Zone focuses on crustal deformation during the seismic cycle. I use computer based models to estimate the amount of fault slip before, during, and after earthquakes, as well as interseismic fault coupling. I am interested in the interaction between seismic and aseismic events (e.g. post seismic afterslip and slow slip events), the time-dependent evolution of these processes, and their seismic hazard implications. Boston College Athletics and Seismology: EagleQuakes! In collaboration with Alan Kafka in the Department of Earth and Environmental Sciences and Weston Observatory, two portable seismographs (raspberry shakes https://raspberryshake.org/) have been installed in Conte Forum and Alumni Stadium to observe the signals produced by cheering, dancing, or booing(!) fans during athletic contests and school events (e.g. Commencement and a Student-Athlete dance off). Our network has also recorded global earthquakes and large storms. Results have been the source of many fun class discussions, student projects, and ongoing collaborative research.